Wikimedia Commons has media related to General strikes. Pages in category "General strikes"
Media in category "General strikes"
The general strike was the first called in Belgium and a decisive moment for the nascent socialist movement in Belgium. According to the historian Carl J. Strikwerda, it was the first true general strike in the history of Europe. The general strike was called on the evening of 11 April 1893 after politicians of Catholic and Liberal parties joined to block a proposal to expand the suffrage. and lasted between 12-18 April. Conservatives, led by the Catholic Prime Minister Auguste Beernaert, feared a full revolution, according to Henri Pirenne, the strike was only called under pressure from the miners of the Borinage and its rapid spread took the POB–BWP leadership, under Emile Vandervelde, by surprise. 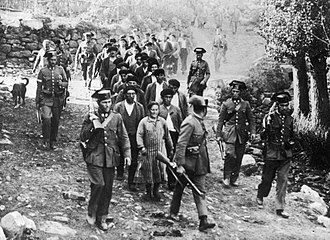 Between 13 and 20 strikers were killed, in total,200,000 workers participated in the strike. In the face of determined opposition, Parliament caved to the Socialist demands and introduced the original reforms, the first elections with the constitutional reforms were held in October 1894. The franchise extension did not benefit the POB–BWP as much as expected, the rise of Social Catholicism, introduced by the 1891 Papal Rerum novarum encyclical, was one of the factors which prevented rapid socialist growth. The elections however brought socialist deputies into parliament for the first time, Neal Ascherson argued that, after 1894, the deepest preoccupation of politics was the determination of Catholic and Liberal to keep the Socialists out of power. The POB-BWP adopted a new manifesto, the Charter of Quaregnon, the issue of electoral reform remained controversial until World War I and further general strikes on questions of franchise reform occurred in 1902 and 1913. 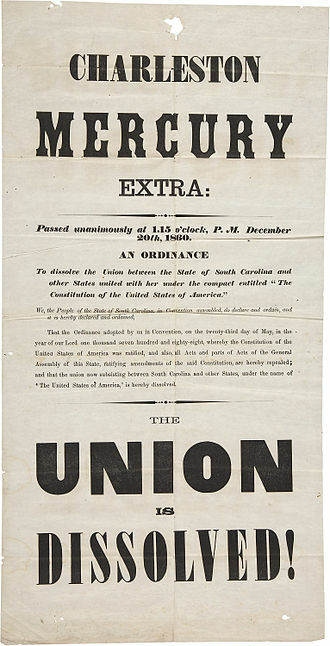 The 1913 strike lead to the promise of reform to the voting system. Plural voting was abolished in 1919 and universal suffrage, giving the vote to all Belgian women, was only introduced in 1948. 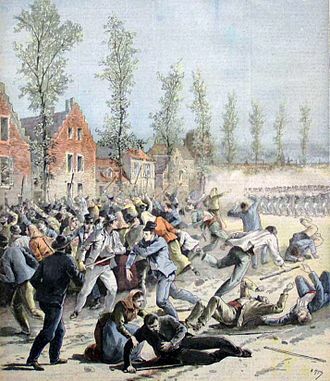 Belgian strike of 1886, the closest precedent for the 1893 general strike General strikes in Belgium Belgium in the nineteenth century Ascherson. The King Incorporated, Leopold the Second and the Congo, la Vie en Rose, Réalités de lHistoire du Parti socialiste en Belgique. A House Divided, Catholics and Flemish Nationalists in Nineteenth-century Belgium, a Revolution for Socialist Reforms, The Belgian General Strike for Universal Suffrage. The Puerto Rican general strike of 1998 began as a strike of Puerto Rico Telephone Company workers to protest a government privatization plan. Three weeks later, an estimated 500,000 people joined a two-day general strike, bringing commerce and pickets were mostly peaceful, but in the week before the general strike some infrastructure elements were sabotaged, and two bombs were detonated. The strike failed to stop the plan, and in July a consortium led by GTE bought the PRTC for US$1.9 billion. ITT ran the PRTC for many years, coordinating telephone service on the island with the governments Interior Department, by the end of 1959, the island had 76,000 phone lines. This was compounded by an October 1973 ruling by the Puerto Rico Public Service Commission, in 1974, Governor Rafael Hernández Colón oversaw the government purchase of PRTC from ITT for a price of US$168 million. The newly nationalized phone company sought to improve service and expand networks, by 1980, the island had 12.9 lines per 100 people, up from 8.3 in 1974. By the 1990s, the PRTC was donating US$100 million each year to the government, in February 1990, Governor Hernández Colón – serving his third and final term – proposed the sale of the PRTC to Bell Atlantic. Hernández Colón suggested that proceeds from the sale would go toward public education, Labor unions in Puerto Rico opposed the sale, and on 28 March 3,800 telephone workers went on a one-day strike. On the same day, a march 150,000 Puerto Ricans proceeded to the building in San Juan. This activity – in addition to a law requiring a $3 billion sale price, once other companies began competing with the PRTC, its size and structure became a liability. Carmen Culpeper, the president, said it was bound by too many government procedures. When Pedro Rosselló became governor of Puerto Rico in 1993, he advocated a program of privatization in a variety of fields. In 1995 the government sold its Puerto Rico Maritime Shipping company, and a number of local government-owned farms, the government should not be competing in areas where it is not effective, Rosselló said. The 1912 Brisbane General Strike in Queensland, began when members of the Australian Tramway Employees Association were dismissed when they wore union badges to work on 18 January 1912. They marched to Brisbane Trades Hall where a meeting was held, the Brisbane tramways were owned by the General Electric Company of the United Kingdom. Despite this they were managed by Joseph Stillman Badger, an American, after this rebuff a meeting of delegates from forty-three Brisbane based Trade Unions formed the Combined Unions Committee and appointed a General Strike Committee. The trade unionists of Brisbane went out on a strike on 30 January 1912, not just for the right to wear a badge. Within a few days the Strike Committee became an alternative government, no work could be done in Brisbane without a special permit from the Strike Committee. The committee organised 500 vigilance officers to keep order among strikers, Government departments and private employers needed the Strike Committees permission to carry out any work. The Strike Committee issued strike coupons that were honoured by various firms, red ribbons were generally worn as a mark of solidarity, not only by people but on pet dogs and horses pulling carts. Daily processions and public rallies were held to keep strikers occupied, on the second day of the strike over 25,000 workers marched from the Brisbane Trades Hall to Fortitude Valley and back with over 50,000 supporters watching from the sidelines. The procession was described as being led by Labor parliamentarians, with the procession being eight abreast, the strike spread throughout Queensland with many regional centres organising processions through their towns. The strike committee regularly issued an official Strike Bulletin to counter the expected anti-union bias in mainstream newspapers and it was only when the strike spread to the railways that the Queensland government became concerned about the situation. At this juncture it banned processions, swore in special constables, commonwealth military officers and spare-time troops volunteered as special constables, and many of the specials wore their commonwealth uniforms into action. The Austrian General Strikes of 1950 were masterminded by the Communist Party of Austria with half-hearted support of the Soviet occupation authorities. In August–October 1950 Austria faced a social and economic crisis caused by anticipated withdrawal of American financial aid. Negotiations between the government and the trade unions stalled, and on September 26 the Communists launched the first general strike, a total of 120 thousand industrial workers walked out of factories, disrupted railroad traffic and harassed government officers. Austrian government, the Socialists and trade unions defused the situation and on September 27 the Communists backed off, the second strike of October 4–5, limited to Vienna and Soviet-occupied Lower Austria, ended in a humiliating defeat. The Soviet support to Austrian Communists was limited to the disruption of police action and provision of trucks for moving communist agents, the British and American occupation forces provided only moral support to the Austrian government. All former allies evaded use of force, no one was killed but dozens of police officers and civilians were injured in street fights. The strikes of 1950 are routinely called a putsch but actual goals of the Communists remain unknown, according to contemporary American press, the August strikes were the most widespread and potentially dangerous since the end of World War II. In 1949 they agreed on two-thirds of the draft of the Austrian State Treaty but its future was vague. By summer of 1950 lack of progress with the Treaty and the communist scare of the Korean War had a impact on the Austrians morale. Allied-occupied Austria was split into four occupation zones, Austrian heavy industry concentrated around Linz, in the American zone, and in British-occupied Styria. Their products were in demand in post-war Europe. Quite naturally, the administrators of the Marshall Plan channelled available financial aid into heavy industry controlled by the American, industry quickly recovered, from 74. 7% of pre-war output in 1948 to 150. 7% in 1951. 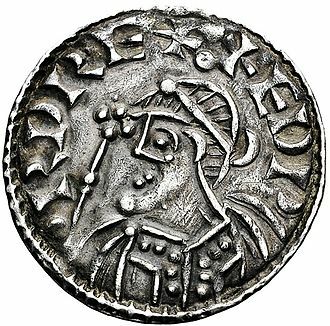 An economic downturn after the wars ended brought increasing unrest. Artisan workers, particularly weavers in Scotland, sought action to reform an uncaring government, gentry fearing revolutionary horrors recruited militia and the government deployed an apparatus of spies and agents provocateurs to stamp out the movement. A Committee of Organisation for Forming a Provisional Government put placards around the streets of Glasgow late on Saturday 1 April, another small group from Strathaven marched to meet a rumoured larger force, but were warned of an ambush and dispersed. Militia taking prisoners to Greenock jail were attacked by local people, James Wilson of Strathaven was singled out as a leader of the march there, and at Glasgow was executed by hanging, decapitated. Of those seized by the British Army at Bonnymuir, John Baird, twenty other Radicals were sentenced to penal transportation. 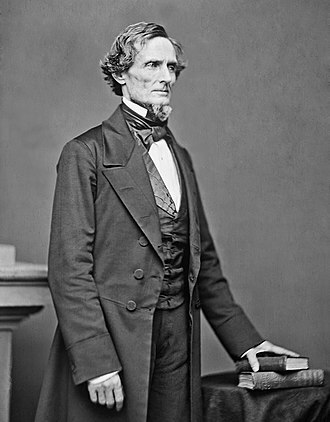 It became evident that government agents had fomented the unrest to bring radicals into the open. The insurrection was largely forgotten as attention focussed on better publicised Radical events in England, two years later, enthusiasm for the visit of King George IV to Scotland successfully boosted loyalist sentiment, ushering in a new-found Scottish national identity. The Scottish Friends of the People society held a series of Conventions in 1792 and 1793, dissent went underground with the United Scotsmen whose activities were curbed with the trial of George Mealmaker in 1798. The authorities were alarmed and set up spies and informers to forestall any further reformist activity. Between and 1815 Major John Cartwright made visits to establish radical Hampden Clubs across Scotland, the end of the Napoleonic Wars brought economic depression. In 1816 some 40,000 people attended a meeting on Glasgow Green to demand more representative government, the industrial revolution affected handloom weavers in particular, and unrest grew despite attempts by the authorities to employ the workless and open relief centres to relieve hardship. Government agents brought conspiracy trials to court in 1816 and 1817, the Peterloo massacre of August 1819 sparked protest demonstrations across Britain. In Scotland, a rally in Paisley on 11 September led to a week of rioting. 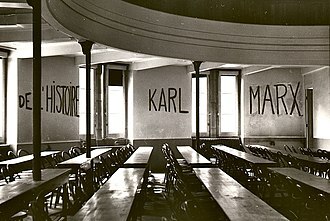 Protest meetings were held in Stirling, Renfrewshire and Fife, on 13 December the Radical Laird Kinloch was arrested for addressing a mass meeting on Magdalen Green in Dundee, but he escaped and fled abroad. The People's Assembly in front of the parliament on 30 June. 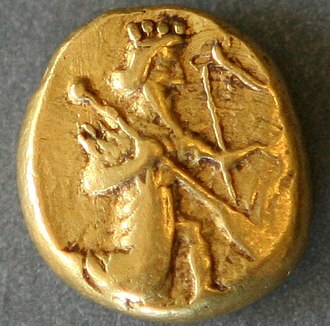 The moutza, an insulting gesture in Greek culture, is extensively used in the protests. 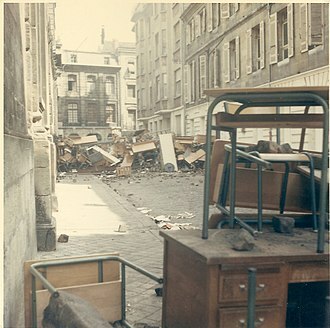 A deserted shopping centre in the Bas du Fort district of Le Gosier, which was blockaded by strikers. A road block near Le Gosier, Guadeloupe, during the strikes. A closed gas station near Le Gosier, after a night of violence. Women marching during the general strike. Radical War monument in Greenock, across the street from the Jail site. The Dutch Gable building of 1755 is seen past the clasped hands, the Mid Kirk of 1761 is to the left. The 'Wobblies' (IWW) joined the general strike and advocated for One Big Union. House Democratic representatives heading down the United States Capitol stairs to meet demonstrators in Washington, D.C.
Demonstrator in New York (2018). International Women's Strike 2018 in Sabadell (Spain). 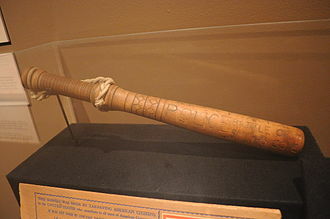 An engraved billy club commemorates police activity in the Battle of Smith Cove in Seattle. Leader of Austrian Communists Johann Koplenig (1963 photo). Oilers from the oil fields of Lower Austria (photo of 2008) formed the strike force of Austrian Communists. 1960 postage stamp commemorating the strike, issued by the Romanian People's Republic. Crowds in Damascus cheering National Bloc leaders headed by Jamil Mardam Bey before they left for talks in Paris on 31 March 1936. Town square meeting in support of the general strike in Jyväskylä, 1956.